Look for the dim glow of the zodiacal light along the ecliptic just after twilight for the next two weeks. Have you ever seen the zodiacal light? It is one of the most remarkable features of the solar system, yet most astronomers have never observed it. I’ve been an amateur astronomer all my life, yet I have seen the zodiacal light only once. This light is the dim glow caused by millions of tiny particles in the plane of Earth's solar system. The solar system was born more than 4.5 billion years ago as a rotating cloud of gas and dust surrounding the new sun. This cloud coalesced into the objects now known as planets and asteroids, but some of the original dust was left behind. Just as the myriad of faint stars cause the amorphous glow seen as the Milky Way, the collection of tiny dust motes that make up the interplanetary dust cloud merge to form an even fainter glow called the zodiacal light. It is called "zodiacal" because it is densest along the ecliptic or zodiac. The zodiacal light is best seen in the evening sky in the months of February and March at the time of the waning moon, which doesn't rise until after midnight. You must be at a totally dark observing site, without the slightest trace of light pollution. Look for the zodiacal light in the western sky about 2 hours after sunset, when all stray light from the sun is gone from the sky. The zodiacal light will appear as an extremely faint cone of light along the ecliptic, due west at this time of year, not to be confused with the Milky Way in the northwestern sky. 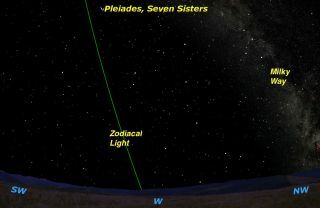 The cone of the zodiacal light will rise toward the bright Pleiades star cluster in the constellation Taurus (the Bull). There is an even rarer manifestation of the interplanetary dust cloud. Like the reflective letters on a road sign, these dust particles reflect light most strongly in the direction from which they are lit. So on the very darkest of nights, when the cone of the zodiacal light reaches the zenith near midnight, there is a faint brightening directly opposite the sun in the sky, known by the German word "gegenschein," meaning "counterglow." However, with the increasing light pollution everywhere in the world now, even at the darkest observing sites, the gegenschein is almost never seen today. Editor's note: If you capture an amazing photo of the night sky and you'd like to share it with us and our partners for a story or image gallery, send images and comments in to managing editor Tariq Malik at spacephotos@space.com.